It was a balmy night in August that brought together innovators, entrepreneurs, risk takers and industry stalwarts for the 15th annual Food and Beverage Industry News Awards. MC’ed by the ABC’s War on Waste host Craig Reucassel, the gala event was a sell out and showcased all that was good about the food and beverage industry in 2017 and 2018. Below are the champions in each category. 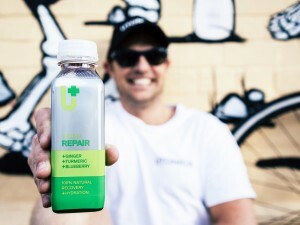 Young South Australian drinks company Utonic Beverages was awarded Beverage of the Year, sponsored by VEGA Australia and the top award – Best of the Best, sponsored by Flavour Makers. Utonic is a functional beverage manufacturer that aims to create and promote a healthier body and mind through naturally great tasting drinks. 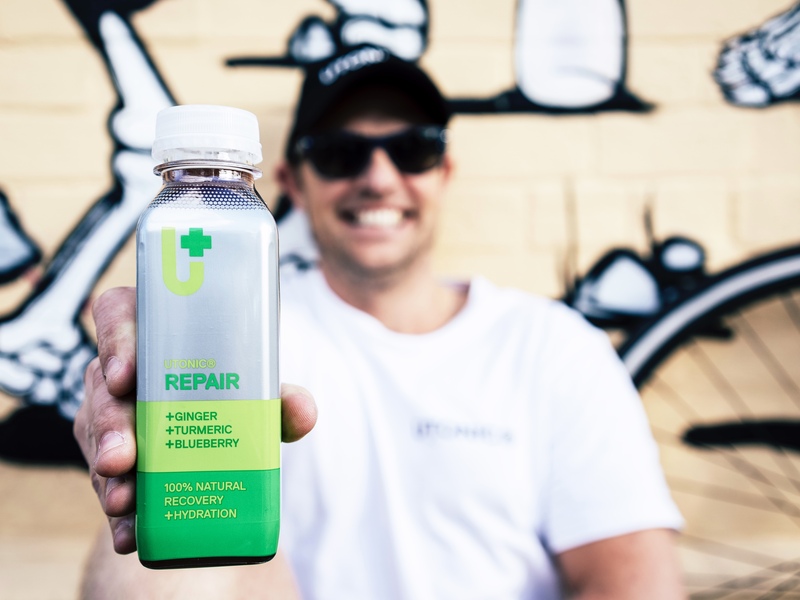 Each drink is backed by science and designed to serve a purpose, whether it’s providing an afternoon boost, recovery from a big night out or stress relief after a hard day at work. The awards were won by the Utonic Repair natural tonic. 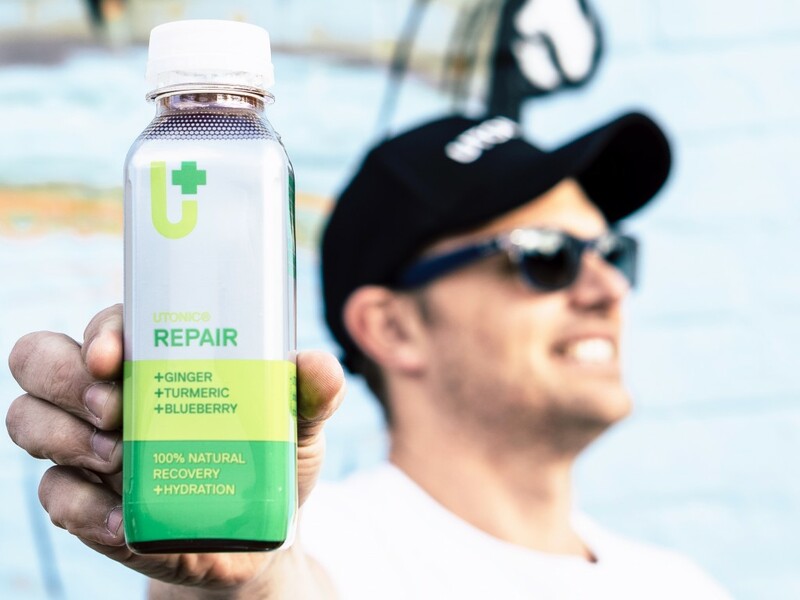 The drink aims to restore the body with powerful antioxidants from blueberry, pomegranate and sour cherry, as well as containing turmeric and ginger, which have been shown to provide anti-inflammatory and anti-nausea functions. Founded in 2016, the company was created by founders Brinkley, Tyson Goldsack, Leigh Morgan and Toby Yap, who shared a belief that it should be possible to lead a healthy life while also achieving daily goals in today’s high-pressure, fast-paced, work, sporting and social environments. The team created a range of scientifically blended drinks produced from concentrated real foods and targeted nutrients. The drinks have no added sugar, preservatives, chemical highs or negative side effects. The drinks include ingredients such as passionflower, sour cherry, chamomile, kale and spirulina. “It’s a very new category,” said Brinkley. “We chose ingredients that had functionality but also tasted good.” It was about getting a balance of good flavours and creating a product that was truly healthy, he said. Utonic released to the market in April 2017, focusing on South Australia first. “Our sales strategy was to focus on our home state first and fine tune our marketing and communication before going national,” said Brinkley. The award came just weeks before Utonic started national distribution with Manassen Foods. The full Utonic beverage collection is avaliable Australia wide from October. Supporting the Australian agriculture industry while developing a sustainable food source, is paramount to the makers of Australian Primary Hemp. The company’s journey began in August 2016, with four friends and a vision of growing and manufacturing a sustainable, high-protein product in Australia. Co-founder and sales director, Skye Patterson said that research highlighting hemp’s nutritional content, sustainability, success in similar western countries and the opportunities to easily integrate into current farming made their decision obvious. At the time, national food standards didn’t allow for the sale and consumption of hemp food products in Australia. But, this did not deter the team. “We were pretty confident it was going to come to fruition,” said Patterson. “On a global sense it was popular, so it was just a matter of time until it took off in Australia.” Laws to legalise the consumption of hemp foods in Australia were passed in late 2017. Now after just two years of business, the company is one of the country’s largest producers of Australian-grown hemp. Australian Primary Hemp handles every step of the hemp process – from farming and production, to packaging and selling. This allows the company to ensure the quality and freshness of all products including de-hulled hemp seeds, cold-pressed hemp seed oil and hemp protein powders. 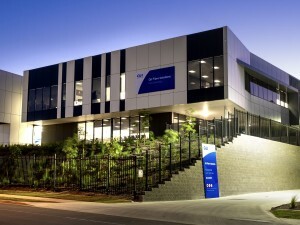 The company’s headquarters are based in Newtown, Geelong, where day-to-day business operations and processing facilities are kept. The hemp is grown across Tasmania, New South Wales, Victoria and South Australia with the company’s partnered farmers. The company continues to grow its four core products – hemp oil, hemp seeds, hemp balance and hemp boost. It also launched hemp milk kits in September, so people can make hemp milk from home. Patterson said the hemp milk is best when sweetened with a few dates. The company also has hemp-based recipes online, including hemp granola bars and hemp tabbouleh. Hemp food is still a relatively new concept in Australia, but Patterson said it is a growing industry. 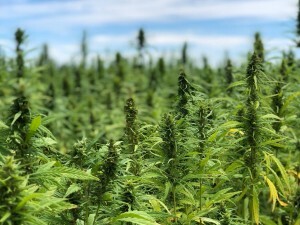 With a focus on health and sustainability, Australian Primary Hemp hasn’t looked back, she said. Botanical Innovations is an Australian manufacturer of phenolic rich flavours, fragrances and ingredients for functional foods and beverages, nutraceutical and cosmeceutical applications. 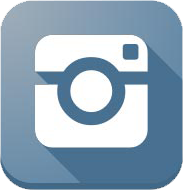 The company invests heavily in research and development, which has led to innovations and the development of a unique range of products. Botanical Innovations won the ingredient innovation section for its apple cider vinegar powder. The company’s managing director, Kerry Ferguson, said a number of people had asked if Botanical Innovations offered natural preservatives that didn’t have a strong flavour. 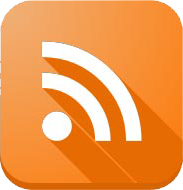 “We look at what the needs are in the market. There’s a demand out there,” she said. The apple cider vinegar powder is naturally fermented. “It has two functions. It can be used as a flavouring and it can also be used as a natural preservative,” said Ferguson. 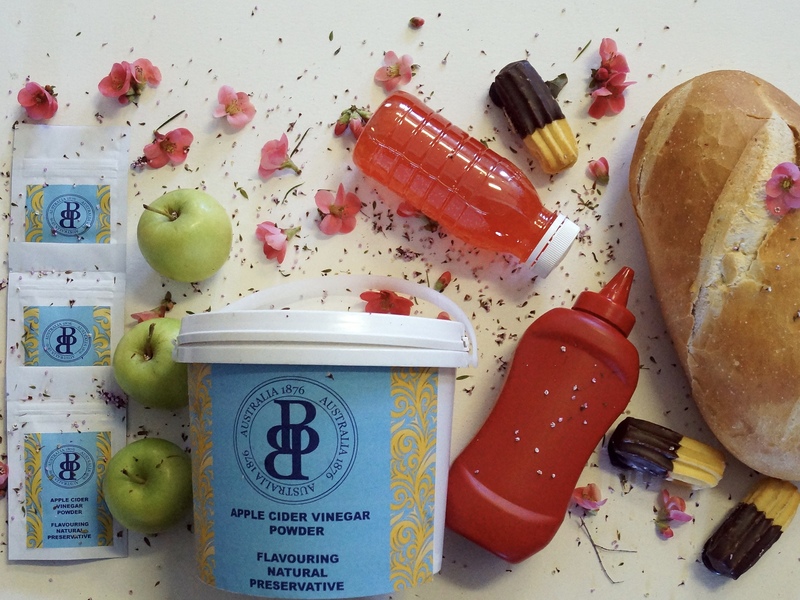 The benefit of Botanical Innovation’s apple cider vinegar powder is that it’s got a neutral taste. “It hasn’t got a terribly strong flavour,” she said. 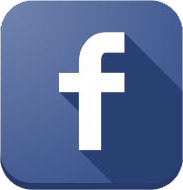 Botanical Innovations is a business-to-business company that supplies to bakeries and other food manufacturers. The apple cider vinegar powder increases the shelf life of products. A bread could last two or three days longer with the powder, said Ferguson. People wanted natural, cleaner products that were not laden with chemicals, she said. Ferguson is passionate about health and providing alternative products to consumers. Vinegar has historically been used to treat diseases and wounds. More recently it’s been used in food and beverages as a health supplement. Botanical Innovations highlights that potential health benefits of apple cider vinegar, and fermented vinegars and extracts, include weight loss, lowering cholesterol and lowering blood pressure. It can also help in preventing and treating diabetes and alleviating asthma symptoms. Other products the company develops include fermented grape seed extract, fermented papaya extract, cherry seed oil, quandong seed oil and sweet pea flower powder. Sunshine Meats started as a small butchery in Redfern, Sydney, in 1988. Founder Jose Pereira took the opportunity to buy the small butcher shop, despite having little financial backing. Thirty years later, his investment is still paying off. Sunshine Meats has now moved away from being a traditional butchery, but business developer Nalita Ferraz said the company’s values remain the same. “We still get phone calls from people wanting traditional meat cuts. We’ve definitely evolved into a totally different business, but it’s always about quality,” said Ferraz. Sunshine Meats won the award for its smoked duck breast. Smoking is what the company focuses on. 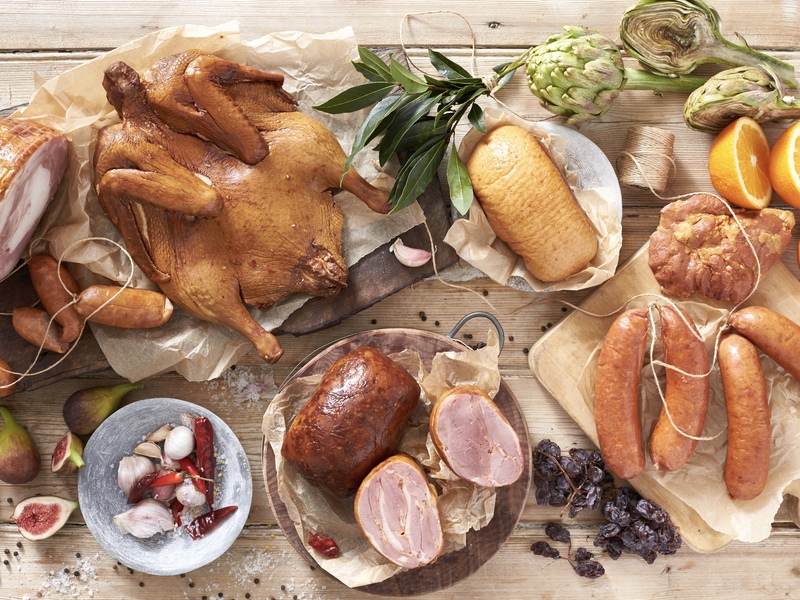 The company has a range of duck products including chorizo, duck thigh and duck breast. The company sells its products at independent and specialty stores. Creating duck products was a great opportunity for Sunshine Meats, as restaurants were using duck due to it gaining popularity with consumers, said Pereira. “Chefs need to rely on a product that’s always going to be consistent. Sunshine Meats is mostly retail based, but we would like to explore the idea of food services. The possibilities are endless,” she said. Pereira and Ferraz agree there are plenty of meals that can be made with the smoked duck breast and other duck products made by Sunshine Meats. But their favourite is a risotto with smoked duck breast or chorizo. COYO is a brand dedicated to making delicious and healthy coconut yoghurt and ice cream. 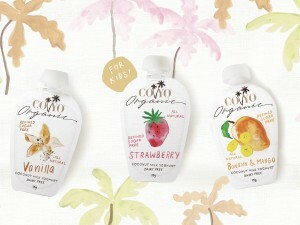 The company won the Health Foods award for its coconut yoghurt kids’ pouches. COYO started with a natural, unflavoured coconut yoghurt and the range has since expanded into offering other flavours such as blueberry, and plum and guava. COYO co-founder Sandra Gosling said the idea was born in 2009 by her husband Henry Gosling. Henry was born in Fiji and grew up with coconut as part of his diet. Sandra said with her background in bacteriology and gut health, and her husband’s life experiences, the company was able to flourish. “It puts us in a unique position,” Sandra said. “We come very much from that health platform and remaining true to our values. We have a philosophy that all our foods and all the we produce has to be delicious. It has to be good for us and it has to be functional,” she said. Despite becoming a successful business, Sandra wasn’t sure at first that coconut yoghurt would work. “It was all about Henry’s idea. He woke up on a Sunday morning with this ridiculous idea saying, ‘I’m going to make yoghurt out of coconut’. I just said, ‘Don’t be stupid, go back to bed’,” she said. There was a lot of soy yoghurt at the time, but no coconut yoghurt, Sandra said. “It’s been a long, very satisfying journey.” More people are becoming interested in plant-based yoghurts. “The tidal wave is coming so it’s very exciting. From an environmental point of view, we have to make some changes, but they have to be changes that are very palatable. It has to be a win-win for everybody, including farmers,” said Sandra. The kids’ pouches were introduced after extensive research, she said. “Our yoghurt doesn’t contain any sweeteners. In the children’s market they screw their noses up a bit so we use an unrefined brown rice syrup so we’ve actually now created a new range,” said Sandra. “The pouches have been incredibly well-received. The kids are loving it.” The Goslings then found out that some adults were wanting slightly sweeter yoghurts as well. COYO has now adapted to cater to the sweeter tooth by creating two bases – one without sweetener and one with unrefined brown rice syrup. “In our ice-creams again, we are very low sugar but no less delicious than other ice creams. We use chicory root – it’s only about a tenth as sweet as sugar,” said Sandra. The COYO kids pouches come in vanilla, strawberry, and banana and mango flavours. 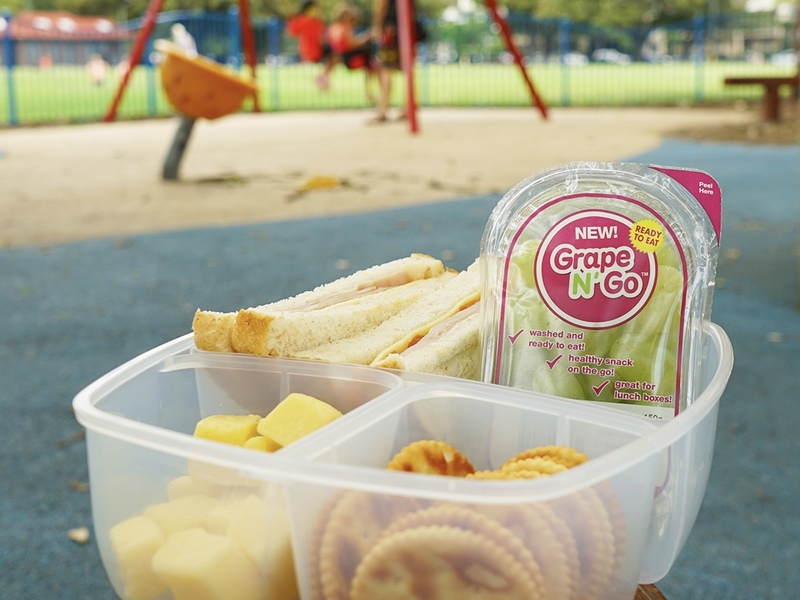 When it came to creating packaging for Grape N’Go, Result Group was there to deliver the next innovation in packaging for table grapes, working alongside Fruit Master and Navi Co Global. Result Group was challenged to deliver packaging that was user friendly, improved shelf life, protected the product from damage and spoilage, improved overall sustainability and reduced product waste. 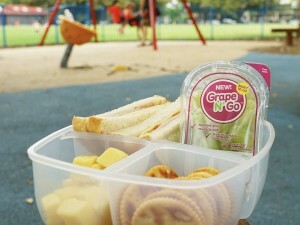 Result Group general manager, Michael Dossor, said Grape N’Go was developed using good design principles based on addressing the product life cycle to achieve a more environmentally sound packaging alternative to what already existed on the market. With Fresh Lid re-closable film, the company managed to meet the brief. “By delivering a fully recyclable pack, as well as addressing the food waste challenges, we were able to address key issues faced by today’s packaging and consumer brand owners,” said Dossor. Result Group is involved in the development of a new range of label applicators developed specifically for the fruit and vegetable sector. “These will be equipped with multifunction labelling capability and offered via a cost-effective platform. We are also using laser coding and marking technology. The great part about laser coding is it gives you the ability to print human readable text as well as symbols and logos, but all without using printing inks,” said Dossor. “Remove the ink and the environmental footprint is unsurpassed. All we are doing is using the laser coder to etch the surface of the product. 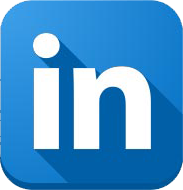 That also helps when it comes to authenticity projects for companies exporting,” he said. Result Group staff enjoyed working on the Grape N’Go project as it had numerous environmental benefits, said Dossor. These include a longer shelf life and consumption window due to the printable Fresh Lid film. With Fresh Lid, less material is used and the need for additional self-adhesive labels is eliminated, which results in a plastic footprint reduction. “The packaging is also 100 per cent recyclable and easily facilitates household kerbside recycling,” said Dossor. “Customers have an appetite for wanting to know that brands are doing their best in the area of sustainability. Packaging is an area that is closely aligned with Result Group’s own sustainability goals and corporate social responsibility,” he said. Result Group aims to keep embarking on projects that aim to deliver a sustainable packaging solution while reducing the environmental impact through the use of equipment in innovative ways. Oji Fibre Solutions produces market pulp, paper and fibre-based packaging products throughout Australia and New Zealand. The company aims to deliver environmentally sustainable products and to work with customers to develop solutions that enhance their business operations. The company successfully opened its state-of-the-art corrugated packaging facility in Yatala in March 2018 and received the award for this plant. The new facility enables Oji Fibre Solutions to meet anticipated growth in demand for packaging solutions. Corrugated packaging products are one of the fastest growing segments of Oji Fibre Solutions, with its paper and product specifications being well-suited for the fruit, vegetables and meat sectors. National sales and marketing manager, Philip Nuttall, said winning the award was a great step to creating more brand awareness. “We’ve invested $70 million in the new plant. It’s great to be recognised for the work,” said Nuttall. “Our biggest strength is our papers.” The company wanted to continue growing in the food sector, he said. The majority of Oji Fibre Solutions’ operations are based in New Zealand, where kraft pulps, packaging papers and a range of packaging products are manufactured from locally-grown softwood plantations, producing materials that are suitable for primary sector packaging systems and are in demand across the globe. The Brisbane-based Yatala Packaging Plant created 300 jobs during the construction phase and now has about 70 employees. The plant has a five-star Green Star environmental rating. It is designed to consume reduced amounts of water and electricity as part of the company’s focus on sustainability. Some of the sustainable features include a rainwater harvesting system, which will reduce potable water consumption by 80 per cent. A 100kW solar PV system, daylight sensors and an efficient lighting control system in the warehouse are also part of the facility. The new plant aims to provide customers with innovative and environmentally sustainable products that enhance their competitiveness, while attracting new customers. It will enable the company to expand its operations in Australia and provide customers with innovative products. HMPS won the award for its HMPS8000 robotic flat-bread packer. The company shows there is an intricate process to packing, stacking and sorting flatbreads. While most people simply enjoy the end product, HMPS was behind the development and build of a system that created the best packaging solution for a flatbread producer. HMPS CEO, Shaun Westcott, said the company needed to meet its clients’ needs to create a product that would allow the flatbreads to be packed in a variety of formats, while increasing productivity. “The project is designed to improve the throughput, productivity and efficiency of our client” he said. HMPS was tasked with packing four different-sized flatbreads, in five different-sized stacks. This needed to be done to fit the customer’s existing carton range and the application required a cycle rate of up to 110 packs per minute. It also needed to adhere to food safety requirements and remain flexible with little operator involvement. “We were successfully able to achieve that for them,” said Westcott. But, the task came with challenges. The HMPS team realised the biggest challenge would be catering to the variety of product sizes, packing formations and varying weights, while still maintaining a good production speed. 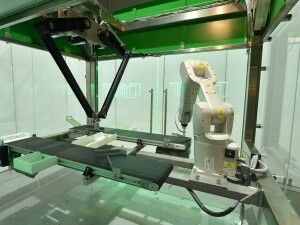 By taking this into consideration, the team opted for the HMPS8000 robotic flat-bread packer as the ideal solution. “We value the opportunity our customers give us to develop new and innovative solutions and recognise our staff for working tirelessly to make it happen. Developing innovative and cutting-edge solutions for our clients, remains an ongoing focus for our team,” said Westcott. HMPS was grateful for the recognition the award gave the company as it continued to offer automated and customised solutions to clients, he said. The company works on projects worldwide, including current jobs such as a specialised packaging solution for packing of pet food pouches in Thailand. HMPS is an Australian-owned company specialising in the design, development and manufacturing of high-quality machinery for packaging processes. The company started off designing and developing bag-in-box machinery in the 1980s. 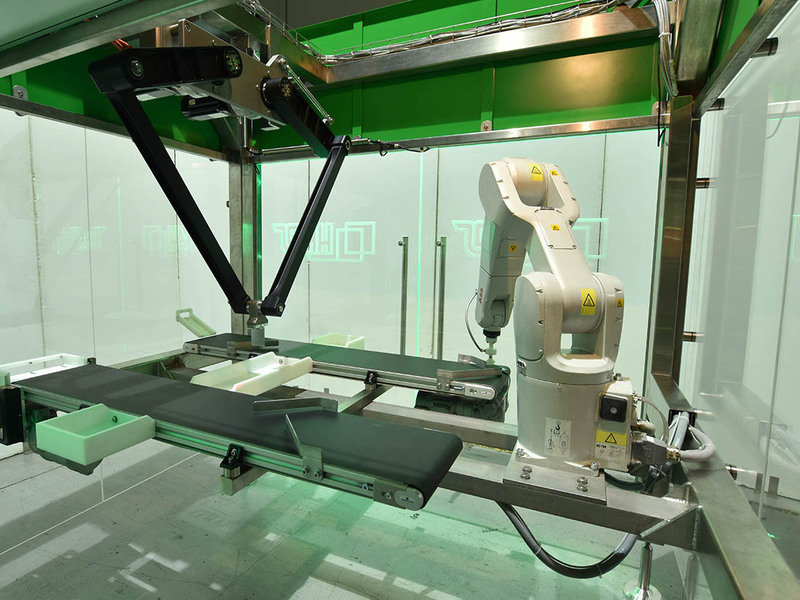 It has since grown to offer case packers, RSC, palletisers, carton erectors and sealers, pick-and-place applications and specialised robotic solutions. HMPS machinery is exported to Asia, South Africa, New Zealand, Europe, USA and other markets across the globe. CCP Technologies is an Australian company that specialises in product development and product management within the realm of the Internet of Things (IoT). The company builds business-to-business hardware and software solutions, which provide customers with a critical control point monitoring platform. For companies such as Earth Walker and Co, this means the Wollongong-based café and general store can save money on refrigeration. CCP Technologies executive director, Anthony Rowley, said monitoring was important considering that refrigeration made up 80 per cent of some companies’ energy consumption. “We tuned an eight-foot by eight-foot cool room and saved the owner $120 a-month,” said Rowley. Earth Walker uses CCP’s wireless temperature monitoring system in its fridges to ensure all perishable foods are kept in optimal condition. Earth Walker co-owner Bianca Poscoliero said she started using CCP’s monitoring system in early 2017, when the café opened. “We’ve got a general store and a café, so we use them in all of our fridges,” she said. “We’ve had a few incidents – including fridges failing.” Poscoliero knows immediately when something is wrong with a fridge as she receives an email and an SMS. 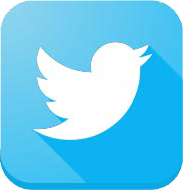 “We’ve also got the app on our phone so at any time we can log on to the app,” said Poscoliero. Earth Walker saved time and money by not having staff members manually check on fridges daily, she said. “It’s made our lives much easier. It’s a weight lifted off our shoulders. We are saving thousands a-year,” said Poscoliero. CCP chief executive officer, Michael White, said based on data captured by CCP, 4.9 per cent of refrigerated coolers and freezers in businesses would suffer a complete failure each year. “In the food industry, if something goes wrong with a fridge, it causes enormous business disruption and can jeopardise food safety,” he said. “While strengthening regulatory compliance remains a key driver for adoption, customers are using our solution to yield energy savings, reduce waste and support preventive maintenance programs,” said White. 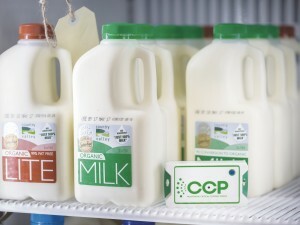 CCP is harnessing the convergence of cloud computing, IoT, blockchain and big data analytics to deliver solutions to food and beverages businesses that help save them money and time.